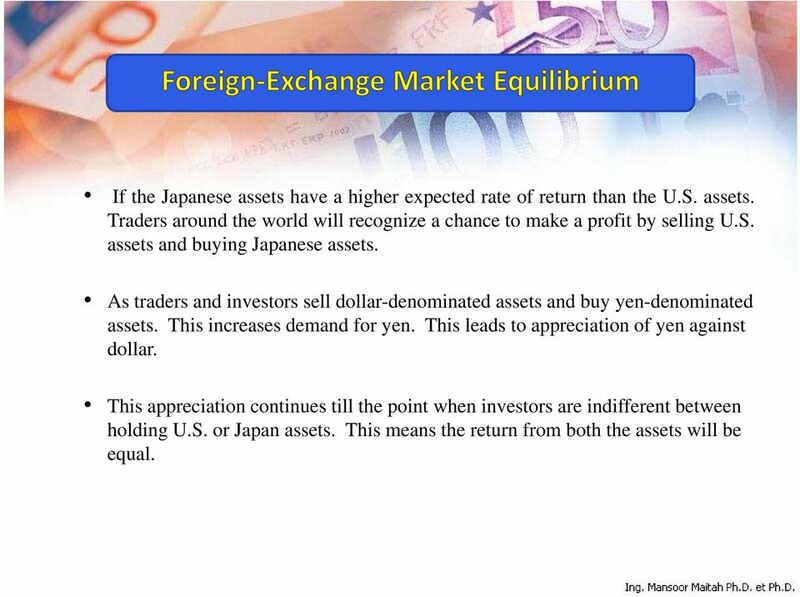 Download "Thank You for Attention"
2 Explain how the foreign exchange market works. 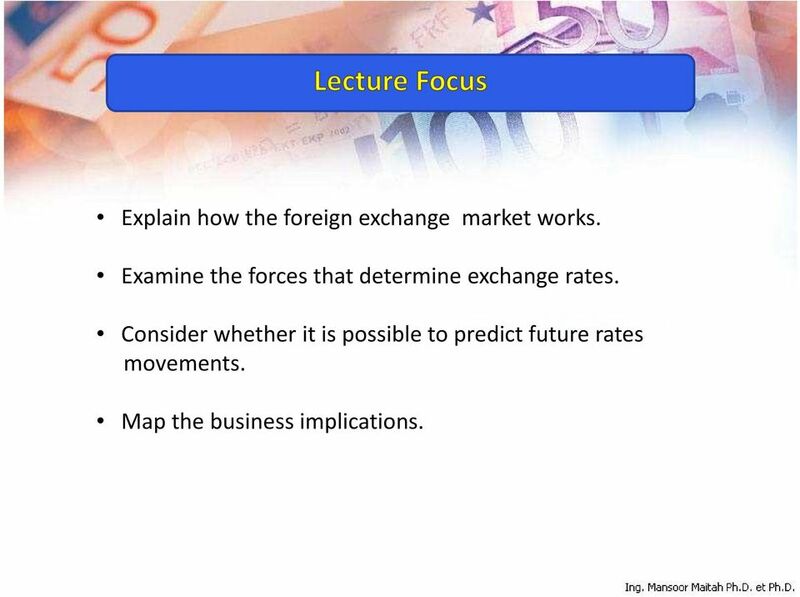 Examine the forces that determine exchange rates. Consider whether it is possible to predict future rates movements. Map the business implications. 3 Foreign Exchange Market: The foreign exchange market is where currency trading takes place. 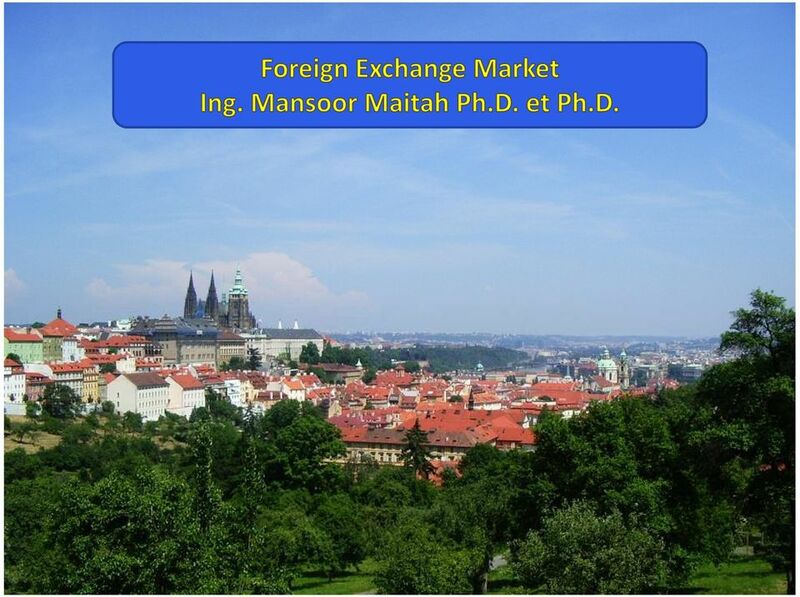 It is where banks and other official institutions facilitate the buying and selling of foreign currencies. 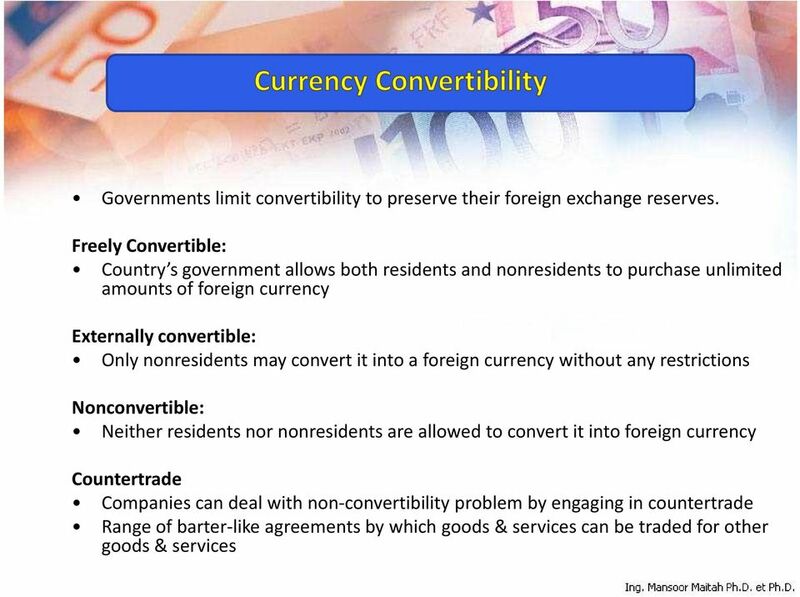 This enables companies based in different countries that use different currencies to trade with each other Exchange Rate: The rate at which one currency is converted into another. 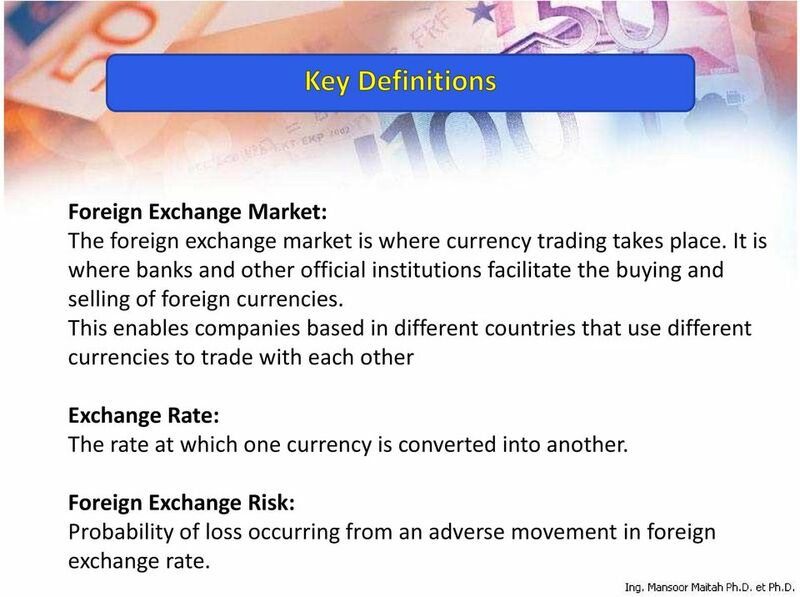 Foreign Exchange Risk: Probability of loss occurring from an adverse movement in foreign exchange rate. 6 Spot rate: Currencies traded for immediate delivery at rates prevailing at the time oftransaction. 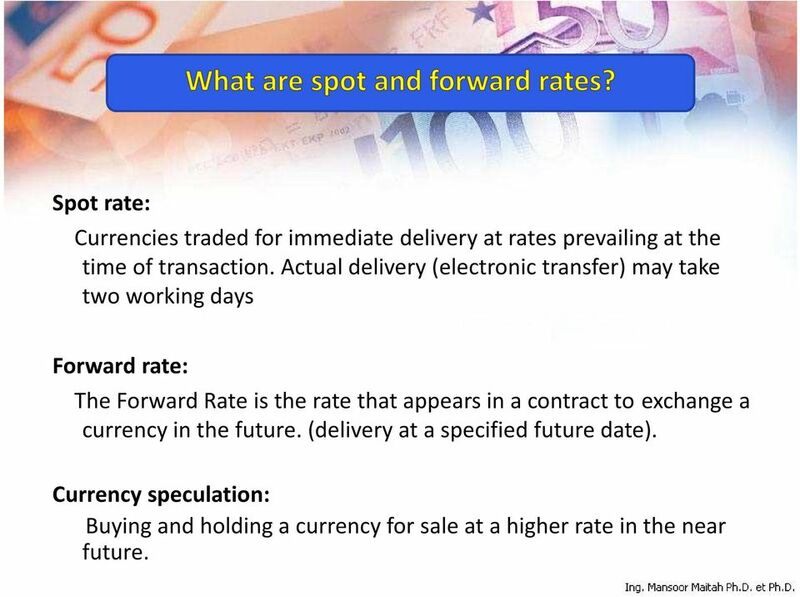 Actual delivery (electronic transfer) may take two working days Forward rate: The Forward Rate is the rate that appears in a contract to exchange a currency in the future. (delivery at a specified future date). Currency speculation: Buying and holding a currency for sale at a higher rate in the near future. 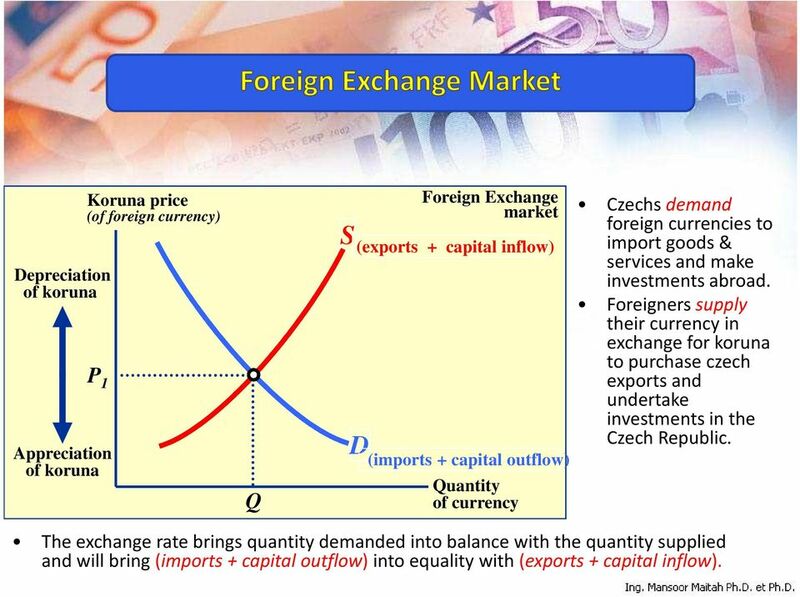 8 When Czechsbuy from foreigners and make investments abroad (outflow of capital),their actions generate a demand for foreign currency in the foreign exchange market. 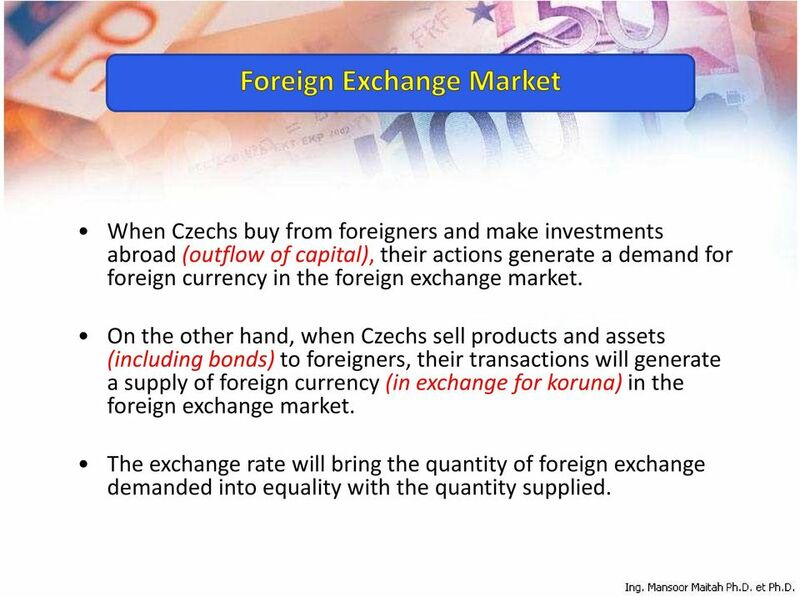 On the other hand, when Czechssell products and assets (including bonds)to foreigners, their transactions will generate a supply of foreign currency (in exchange for koruna)in the foreign exchange market. 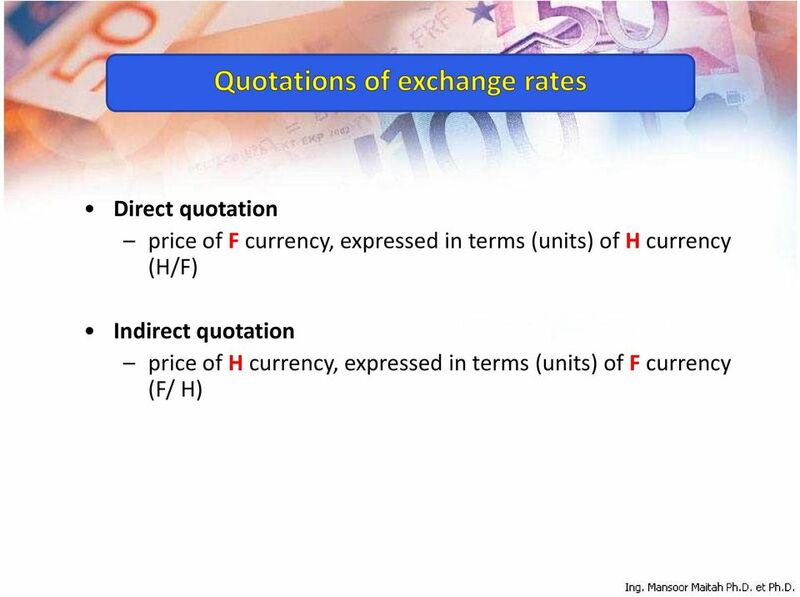 The exchange rate will bring the quantity of foreign exchange demanded into equality with the quantity supplied. 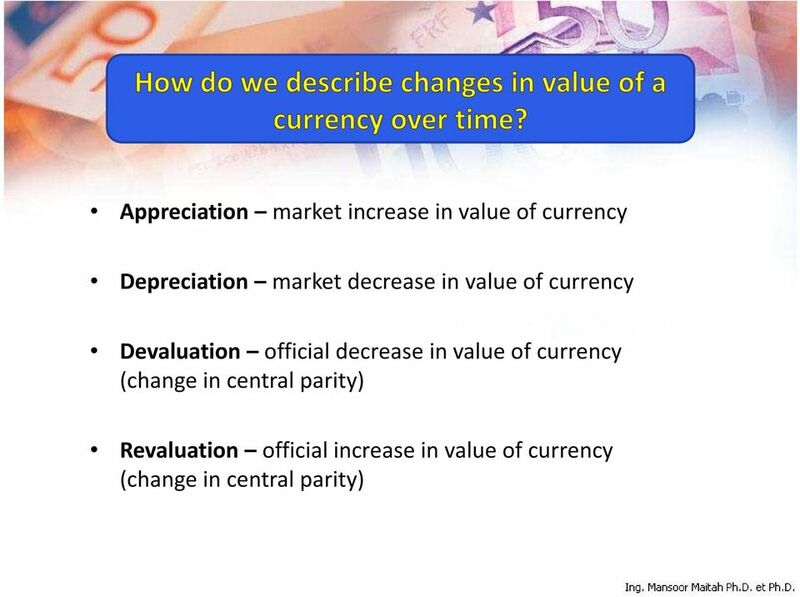 9 Depreciation of koruna Koruna price (of foreign currency) P 1 Appreciation of koruna Q Foreign Exchange market S (exports + capital inflow) D (imports + capital outflow) Quantity of currency Czechs demand foreign currencies to import goods & services and make investments abroad. Foreigners supply their currency in exchange for koruna to purchase czech exports and undertake investments in the Czech Republic. 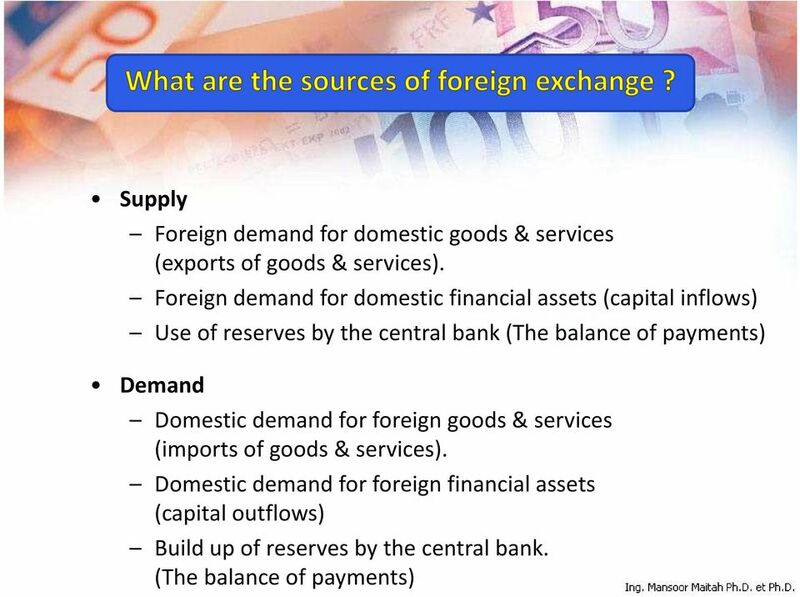 The exchange rate brings quantity demanded into balance with the quantity supplied and will bring (imports + capital outflow) into equality with (exports + capital inflow). 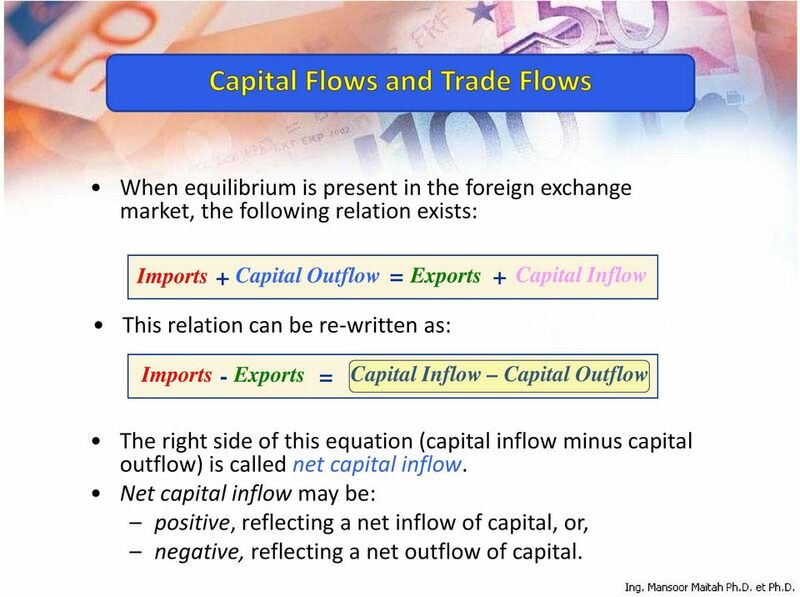 10 When equilibrium is present in the foreign exchange market, the following relation exists: Imports + Capital Outflow = Exports + Capital Inflow This relation can be re-written as: Imports - Exports = Capital Inflow Capital Outflow The right side of this equation (capital inflow minus capital outflow) is called net capital inflow. Net capital inflow may be: positive, reflecting a net inflow of capital, or, negative, reflecting a net outflow of capital. 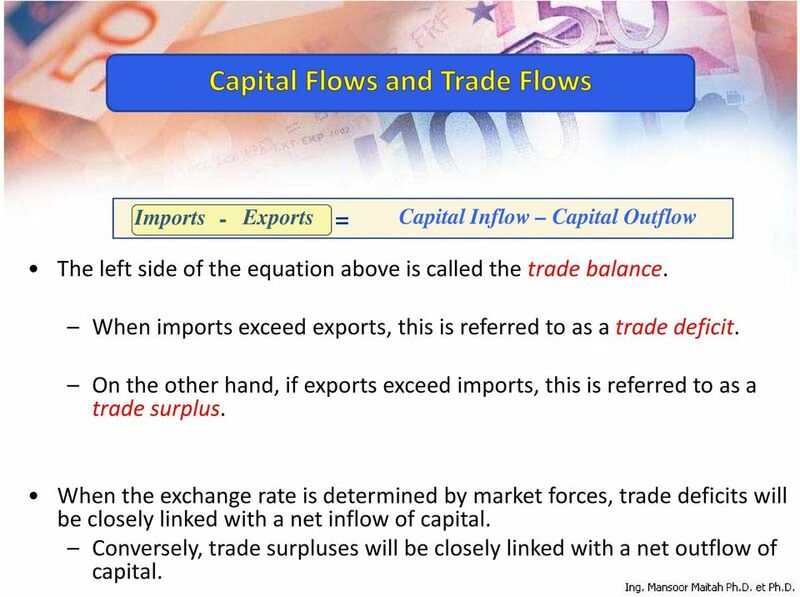 11 Imports - Exports = Capital Inflow Capital Outflow The left side of the equation above is called the trade balance. When imports exceed exports, this is referred to as a trade deficit. On the other hand, if exports exceed imports, this is referred to as a trade surplus. When the exchange rate is determined by market forces, trade deficits will be closely linked with a net inflow of capital. Conversely, trade surpluses will be closely linked with a net outflow of capital. 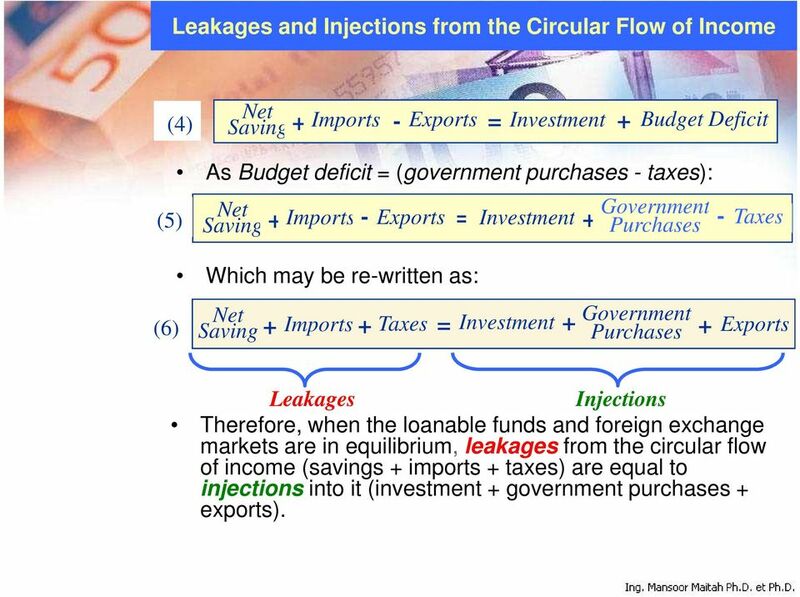 13 Leakages and Injections from the Circular Flow of Income (4) Net Saving + Imports - Exports = Investment + Budget Deficit (5) As Budget deficit = (government purchases - taxes): Net Saving + Imports - Exports = Investment Government + Purchases - Taxes (6) Which may be re-written as: Net Saving + Imports + Taxes = Investment + Government Purchases + Exports Leakages Injections Therefore, when the loanable funds and foreign exchange markets are in equilibrium, leakages from the circular flow of income (savings + imports + taxes) are equal to injections into it (investment + government purchases + exports). 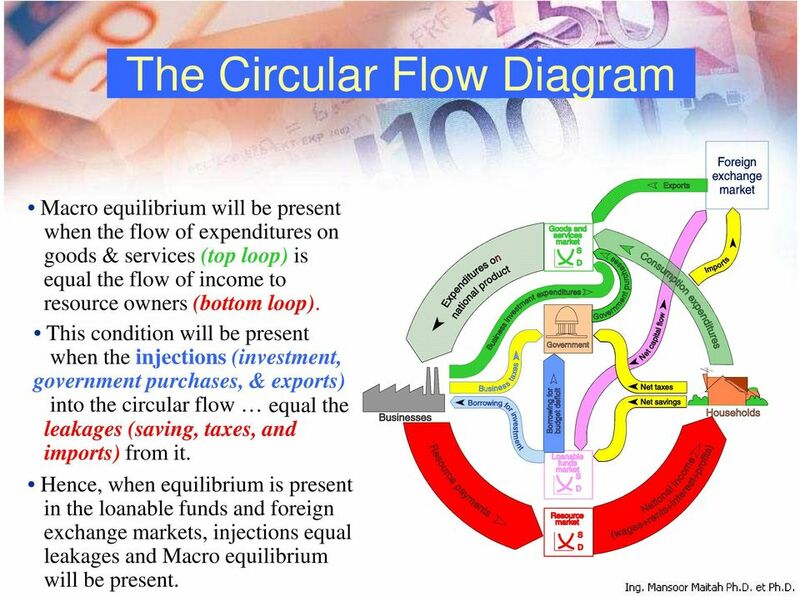 14 The Circular Flow Diagram Macro equilibrium will be present when the flow of expenditures on goods & services (top loop) is equal the flow of income to resource owners (bottom loop). 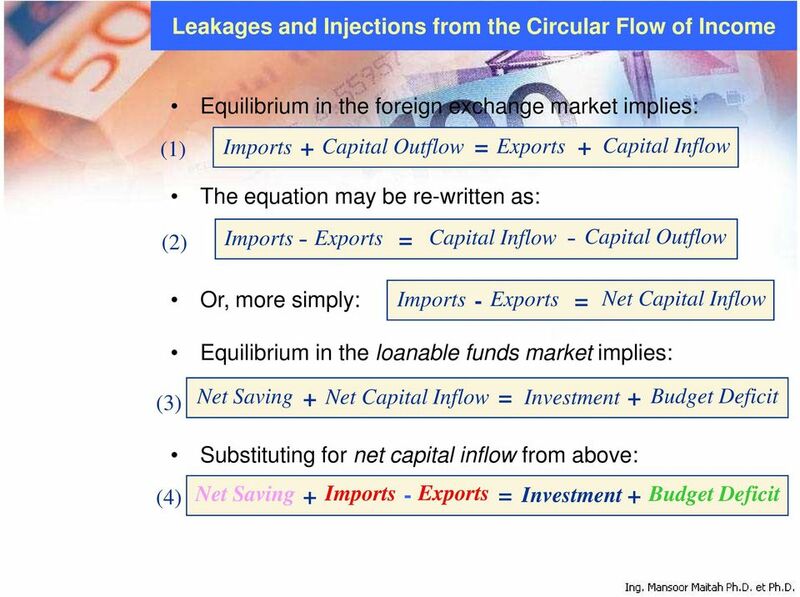 This condition will be present when the injections (investment, government purchases, & exports) into the circular flow equal the leakages (saving, taxes, and imports) from it. Hence, when equilibrium is present in the loanable funds and foreign exchange markets, injections equal leakages and Macro equilibrium will be present. 15 Demand and supply in the loanable funds market will determine the interest rate. When demand for loanable funds is strong (D2),real interest rates will be high (r2) and there will be a inflow of capital. 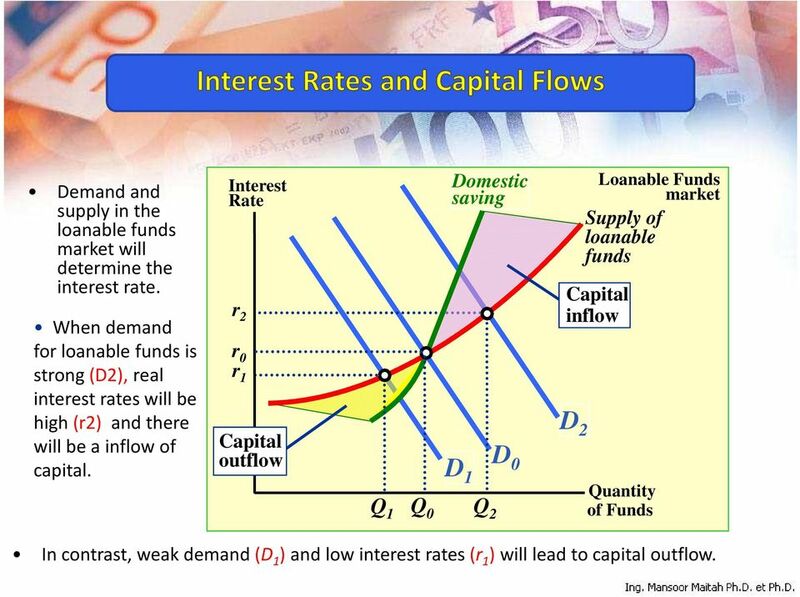 Interest Rate r 2 r 0 r 1 Capital outflow Q 1 Q 0 Domestic saving D 2 D D 0 1 Q 2 Loanable Funds market Supply of loanable funds Capital inflow Quantity of Funds In contrast, weak demand (D 1 )and low interest rates (r 1 )will lead to capital outflow. 18 If the Japanese assets have a higher expected rate of return than the U.S. assets. Traders around the world will recognize a chance to make a profit by selling U.S. assets and buying Japanese assets. As traders and investors sell dollar-denominated assets and buy yen-denominated assets. This increases demand for yen. This leads to appreciation of yen against dollar. This appreciation continues till the point when investors are indifferent between holding U.S. or Japan assets. This means the return from both the assets will be equal. 19 Lets assume U.S. interest rate to be 5%. Lets call it R the domestic expected rate of return. Suppose that future yen/dollar exchange rate is 100 and Japanese interest rates are 5%. 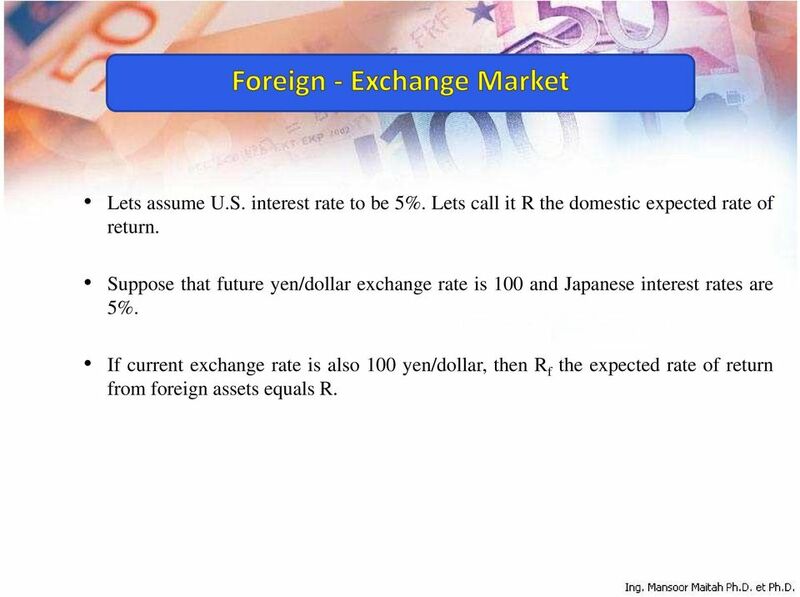 If current exchange rate is also 100 yen/dollar, then R f the expected rate of return from foreign assets equals R.
20 But if current exchange rate is 105 yen/dollar and the future expected exchange rate is 100 yen/dollar, that means dollar is expected to depreciate. The dollar is expected to fall by 4.8%. 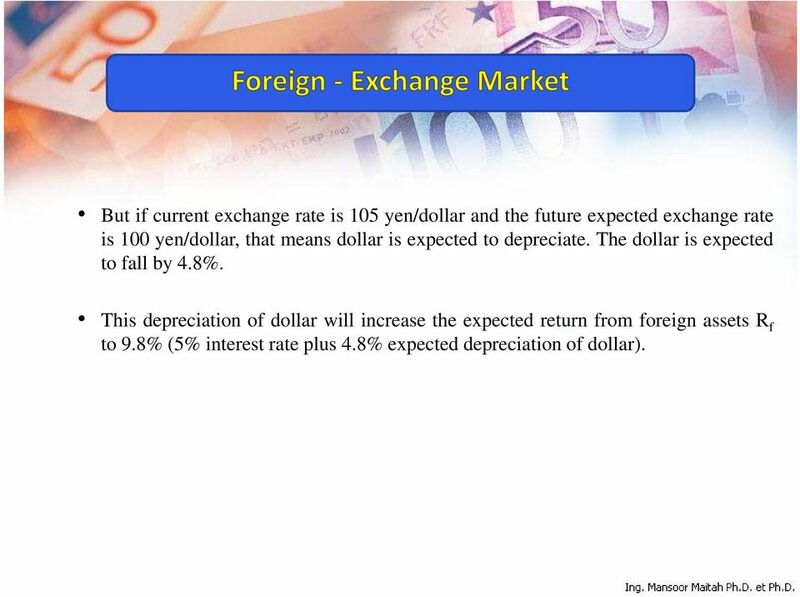 This depreciation of dollar will increase the expected return from foreign assets R f to 9.8% (5% interest rate plus 4.8% expected depreciation of dollar). 21 Alternatively, if current exchange rate is 97 yen/dollar and the expected future exchange rate is 100 yen/dollar. The dollar is expected to appreciate by 3.1%. This would imply that the expected rate of return from foreign assets R f will fall This would imply that the expected rate of return from foreign assets R f will fall to 1.9% (5% interest rate minus 3.1% expected appreciation of dollar). 22 Alternately if the domestic real interest rates fall, it will lead to shifting of expected real rate of return towards left. This would result in falling of exchange rates. That means depreciation of the domestic currency. 24 Real exchange Rate: R=E. 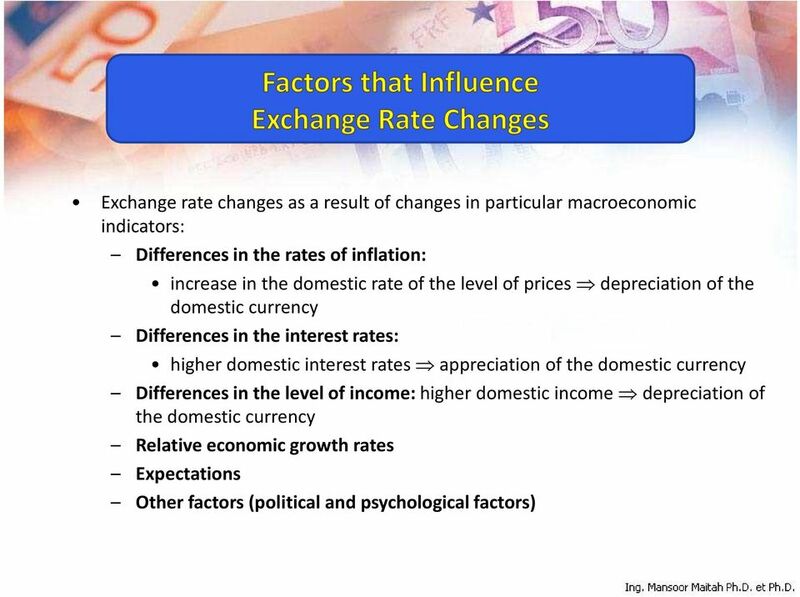 PF/P E -nominal exchange rate P -price level of domestic good PF - price level of foreign good R -real exchange rate Decrease of R is real appreciating and vice versa...! Purchasing Power Parity (PPP) Holds that the prices of identical goods should be the same in all countries. It is simply the law of one price applied to the international market.